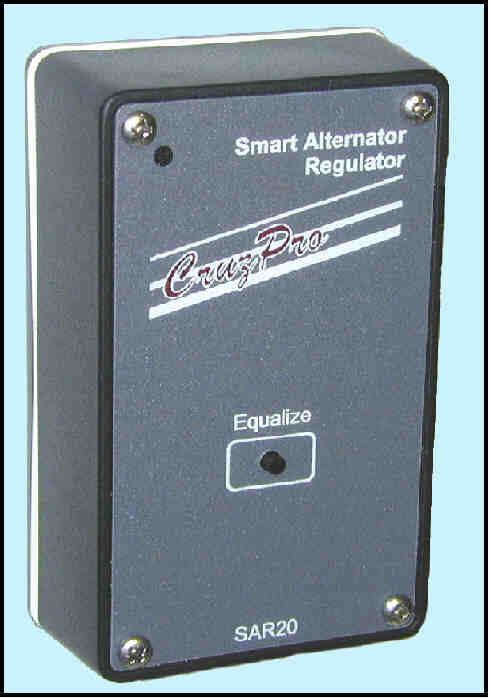 The SAR20 Smart Alternator Regulator turbo-charges your charging system by swapping your fixed voltage regulator with a high performance multi-step Smart Alternator Regulator (SAR). The CruzPro SAR20 enables you to safely fast charge your boat batteries thereby greatly reducing engine run time. Obviously, fewer hours of engine running saves wear and tear, fuel, and leaves more undisturbed time to enjoy cruising. Your neighbors will also appreciate the extra quiet time. The SAR20 is a multi-step charge controller that commands maximum safe output from your alternator while monitoring battery voltage and temperature. The SAR20 will deliver the bulk of the battery charge at maximum alternator output allowing battery voltage to rise until the "absorption voltage" has been reached. The SAR then lowers the alternator output to maintain a constant battery voltage at the absorption point. The absorption voltage is maintained for a period of time dependent upon several factors and then the SAR20 cuts back the battery voltage to a safe "float" voltage. The SAR20 will also enable you to desulfate your battery plates by enabling an "equalization cycle". During equalization the SAR20 slowly raises battery voltage to an equalization level while limiting the charge current to about 4-6% of your battery's amp-hour capacity. This safely dissolves the sulfates that form on the battery plates during discharge and extends battery life. The correct absorption, float and equalization voltages are dependent upon temperature and battery chemistry. The higher the temperature the lower values of absorption, float and equalization voltages that must be used to optimize battery life. For this reason a remote sensor is used by SAR20 to monitor battery temperature and adjust the voltages accordingly. The SAR20 also has some programming switches inside to tell it what type of battery you are using and further adjust the charging voltages accordingly. Your fixed voltage regulator knows nothing about battery temperature and will almost always be charging to the wrong value. During the bulk delivery phase the SAR20 will command the alternator to deliver maximum output continuously until the absorption voltage is reached. While many modern alternators can do so, some alternators are not "hot rated" to deliver full output continuously and can be damaged by excessive heat. For this reason the SAR20 can be told whether your alternator is hot rated or not and will automatically cut back the output of a non hot-rated alternator to a safe level after a while. With today's heavy loads being demanded by the electrical and electronic conveniences found on many boats it's becoming more common for a second alternator to be fitted to the engine. If you're shopping for a SAR, try to find one that has enough grunt to drive a second alternator field winding. Most alternators require about 3-4 amps excitation to their field winding in order to deliver maximum output so the SAR20 is designed to deliver 8 amps, driving up to two high output alternators. Another handy feature of the SAR20 is a trouble-shooting LED that tells you what it's doing. The LED will blink in various combinations to tell you what stage the SAR20 is in (bulk, absorption, float, equalization). The SAR20 can be set for either 12 and 24 volt alternators.